Infirmary Mound is a classic Cap City course, fast, rolling terrain with off cambers, significant climbing, and wide open turns. 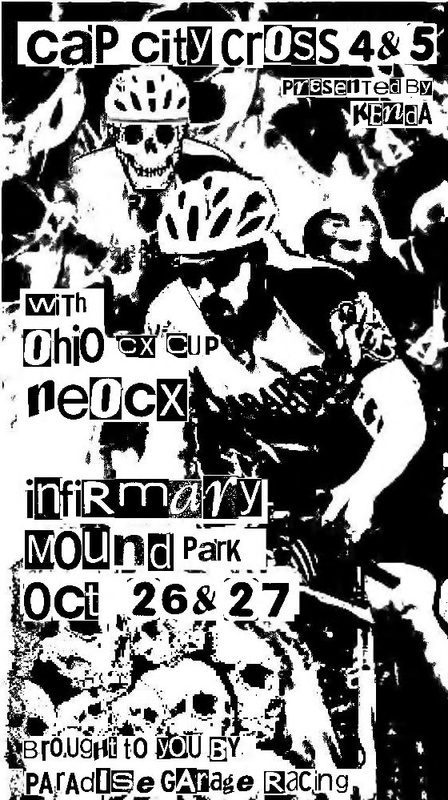 This euro style course will play host to an ultra-competitive mash up field from Cap City Cross, Ohio CX Cup, and NEO CX. One weekend, two races, points for THREE series. That’s right, this weekend we have two Cap City races (#4 & 5), and thus two chances for Cap City series points, but wait, there’s more. Saturday’s race counts for points in Ohio CX Cup and DOUBLE points in NEOCX. Paradise Garage Racing has put together two totally different courses for the weekend; Saturday will feature a more traditional CX course with challenging corners, a short, but steep, rooted run-up or climb, and little opportunities to rest. Perfect for the championship level Ohio CX Cup racing. While, Sunday will feature an extended climb and a longer course, but faster racing. Both courses feature a deceivingly difficult uphill finish, a few great spectator locations, and easily accessible pits, with multiple hose hookups (have a pressure washer?). Feel free to work up an appetite out on the course, Yellow Brick Pizza will be there all day on Saturday serving up hot slices of pizza. Competitors will be racing for prizes from Kenda, Homage, Seventh Son Brewing, Kona and more! For those staying in town for the weekend, join us Saturday night at Seventh Son Brewing (1101 N. 4th st. Columbus, Ohio 43201) for a cyclocross halloween party! Drink specials for racers, costumes not required but encouraged. Wear your costume on Sunday for preferential call-up. We also have a Facebook event here. Pre-registered racers get priority call-up on Saturday per Ohio CX Cup rules. But, as always, day of registration is available for no extra fee.